Rickie Roo is an agility dog, a service dog and a roving reporter for the United States Dog Agility Association. 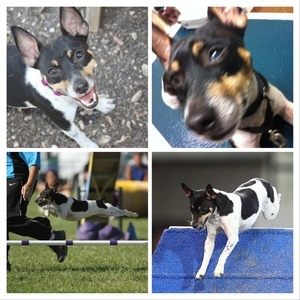 She is well known in the sport of agility and in the rat terrier community. On October 12th, 2013, Roo unfortunately had to have emergency surgery because of a luxated lens in her left eye. Primary Lens Luxation, or PLL, is a condition that can happen in many breeds including American Eskimo dog, American hairless terrier, Australian cattle dog, border collie, bull terrier, Chinese crested, Jack Russell terrier, jagdterrier, Lakeland terrier, Lancashire heeler, miniature bull terrier, Norwich terrier, Parson Russell terrier, Patterdale terrier, rat terrier, Russell terrier, Sealyham terrier, Teddy Roosevelt terrier, Tenterfield terrier, Tibetan terrier, toy fox terrier, Volpino Italiano, Welsh terrier, wire fox terrier, Yorkshire terrier.